As some of you may have noticed I have been on a bit of a blogger sabbatical. My time has been limited in the past few months as I have been launching my own company (www.volumecommunications.com). I have very much missed profiling my dinners and the great response I had received. Tonight’s dinner was inspired by my roommate’s favorite dish, traditional mexican style quesadillas. In addition to making tonight’s menu healthier I decided to add a gourmet twist. By adding half low-fat mozzarella to my cheese mixture and no-fat sour cream I was able to cut the fat content. I also replaced traditional flour tortillas with a whole wheat version providing a higher fiber content. Fiber has been proven to lower cholesterol and helps to regulate glucose levels in the blood. 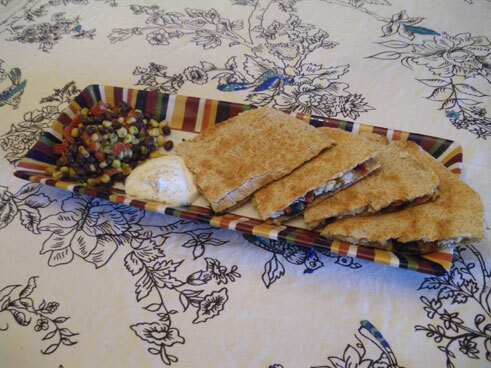 Pairing the quesadillas with a black bean salad completes this fiber packed menu. Prep time: 20 mins. | Cook time: 10 mins. Heat a large skillet over medium heat. Wipe the pan with an oil damped paper towel. 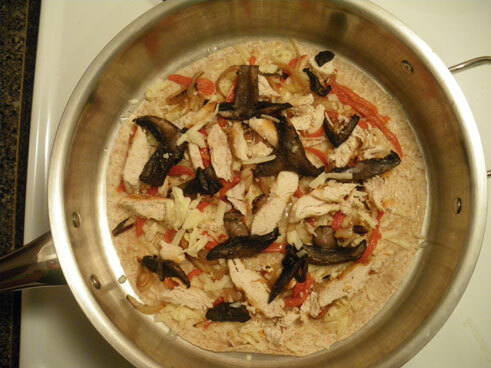 Place one tortilla in the pan and top with 1/2 the cheese mixture, chicken, mushrooms, onions and roasted red peppers. Top with another tortilla and cover pan with a lid. 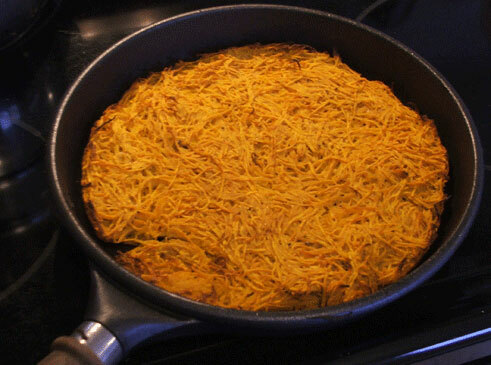 Once bottom tortilla is golden brown and cheese is melted flip to the opposite side and cook till golden brown. Repeat these steps for the second quesadilla. To serve cut into four wedges and serve with sour cream, salsa and bean salad. Thick-cut double smoked bacon, blue cheese, fried egg and foie gras topped upon a juicy 1/2 pound prime rib patty. The rise in popularity of gourmet burgers has us salivating over fat laden creations between two buns. 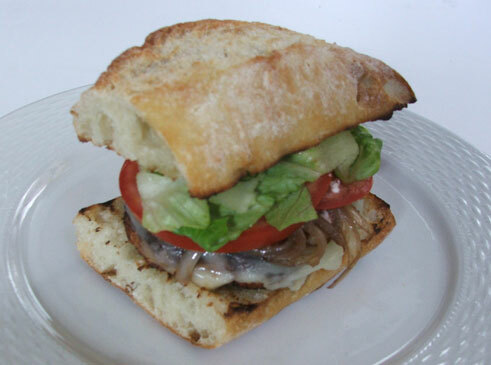 Although I love a good juicy beef burger I try to indulge as modestly as possible. Substituting ground beef for chicken or turkey can cut fat significantly. When removing the fat from your patties you must replace that flavor with healthy alternatives. As a special request from a faithful reader, here’s a recipe that will provide all the flavor without tipping the scale. Place a medium skillet over medium-low heat. Add olive oil and onions. Let saute for approx. 20 minutes stirring occasionally until golden brown. Season with S&P. Heat your grill to high. Add ground chicken to a large mixing bowl. Break in egg and mix well. Add panko, sauces, mustard, rosemary , S&P and mix well with hands. Add more panko if the mixture is loose. Form into 6 large patties and place on parchment paper. Cut buns and swipe with olive oil. Set aside. Place patties on a hot grill and turn heat down to medium-low. Cook for approx. 10-15 mins or until the internal temperature has reached 170º. When almost ready place cheese over patties and buns on grill to toast slightly. To serve mix mayo with roasted garlic and spoon on to buns. Add caramelized onions and additional toppings. After Monday night’s meal I was in need of a simple but delicious menu. I decided upon veal knowing it’s quick to cook and doesn’t need a lot of added flavour. 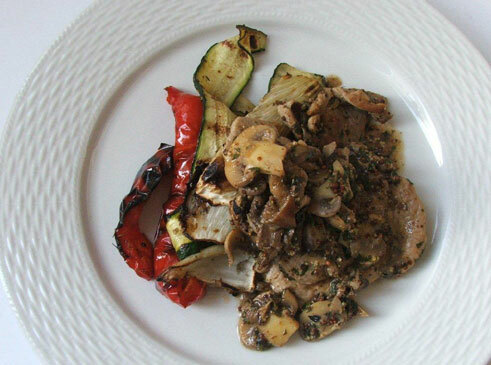 Although veal tends to be quite high in fat, the great thing about this recipe is how little meat you need. I opted to serve this dish with an esthetically pleasing salad making it a great dinner for summer patio entertaining. Preheat your oven to 400º. 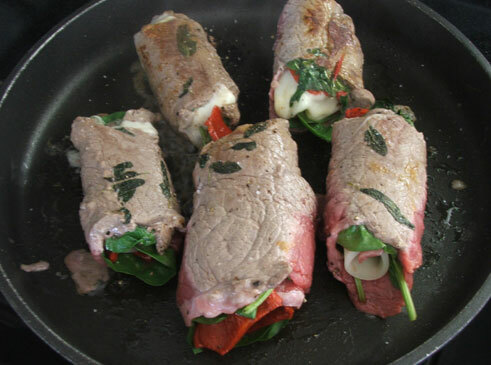 Place each veal portion separately on a cutting board and cover with a piece of parchment paper. Using a meat mallet, pound veal cutlet to thin out slightly. Top with spinach and roasted red pepper. 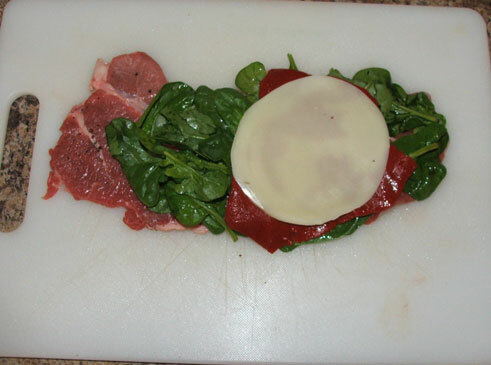 Season with S&P and top with provolone (see photo below). Roll up from larger end and pin closed with a toothpick. Place pecans in oven and let toast. This should take approx. 5 minutes. Remove when done and set aside till cooled and chop. Place a large skillet over medium heat. Add the olive oil and minced garlic. Saute until garlic is golden brown. Add the sage leaves and increase heat to high. Add the veal roulade portions and sear to golden brown on all sides. Place in oven and let for approx. 15 minutes. Add your lettuce to a large serving bowl. 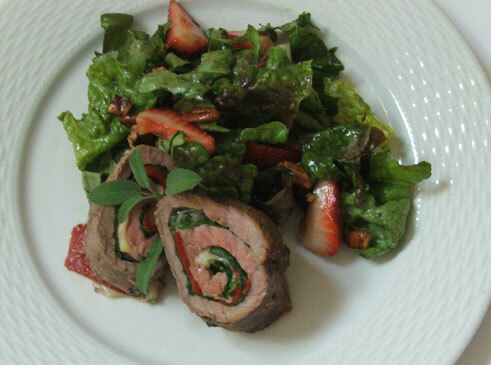 Top with strawberries, red pepper and chopped pecans. When your veal is ready to serve, toss salad in balsamic dressing. 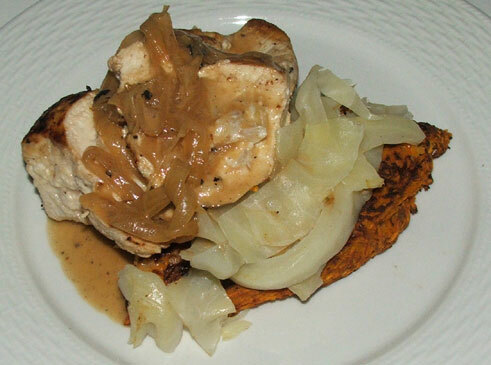 Tonight’s Menu: Chicken stuffed with caramelized onion, apple and cream cheese topped with a sour cream jus served with steamed cabbage and potato pancakes. Stuffed chicken breasts are one of my favorite dishes to prepare. Not only are there so many flavour combinations to choose from, they also look great on your plate. I have stuffed chicken breasts many different ways so I opted to show you my favorite and a sure-fire way to avoid losing your stuffing during the cooking process. If you’re not so keen on cabbage or have cut potato from your diet this recipe works well with grilled vegetables as well. Place a medium skillet over medium-low heat and add 1 tbsp. olive oil and onions. Leave to cook stirring occasionally for approx. 15 minutes or until golden brown. Transfer the onions into a bowl and set aside the pan to be used for your chicken. Heat oven to 400º. In a large bowl mix together potato, egg, nutmeg and S&P (about 1 tsp. each). Grease a large skillet with olive oil. Press potato mixture firmly into skillet and set on medium-low heat. When the potato has browned slightly on the bottom insert the skillet into the oven for approx. 20 minutes. In a small bowl mix together 3/4 of caramelized, cream cheese and apple. season with S&P and set aside. 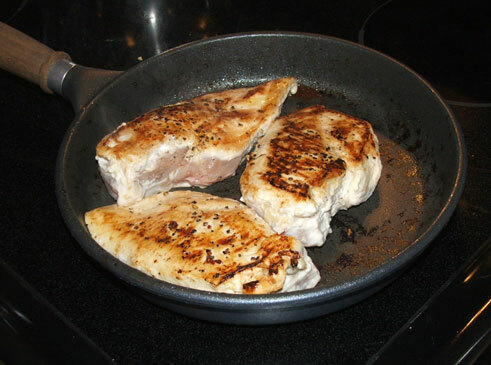 Prepare chicken by inserting a sharp knife into the large portion of the breast and create a cavity without puncturing the top or bottom of the breast. See the (poorly done) video below for a visual. Be sure not to make your incision too large or the stuffing with escape during the cooking process. When your chicken is stuffed, heat the skillet used for the onions over medium-high heat. When the pan is hot add 1 tbsp. olive oil and your stuffed chicken. Season with S&P and brown on both sides. Transfer the chicken from the skillet into an oven safe pan and set aside your skillet to be used for the sauce. Insert into oven for approx. 15 minutes or until cooked throughly. 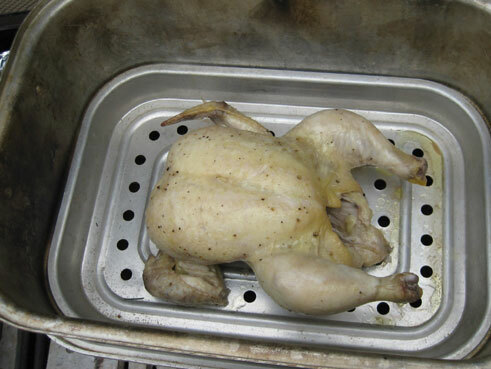 It is best to use a thermometer when cooking chicken. The internal temperature should reach 170º. When there is 10 minutes remaining you should start to steam your cabbage. Place skillet used for the chicken back on to the stove and increase heat to high. Deglaze the pan with the wine then add the stock. Reduce to 1/4 of original volume, season with S&P and add in remaining caramelized onions. Set aside. When everything has finished cooking set your sauce back onto low heat and stir in the sour cream. Carefully flip the pancake onto a cutting board. Portion into four even wedges and set onto plates. Top with cabbage and chicken (I like to cut the chicken on a bias through the middle to show the stuffing), then top with sauce. During a recent visit from my dear friend Shawn (http://itallstartswithbutter.com), I assigned him the task of cooking me a low-fat meal. Shawn is a great cook and an even better judge of other’s cooking. He decided upon scallopini and since the local butcher had just run short on veal we decided to use pork as a backup. Shawn normally would add butter and a small amount of heavy cream to his classic version but decided to cut this out for my sake. I must say this modified version was equally delicious and eye pleasing. My task was to provide a side that complimented his dish. In an attempt not to over complicate the meal I decided to stick with a selection three vegetables done on the grill. This meal was packed full of flavor, low in fat and best of all, served with great conversation. Prep time: 20 mins. | Cook time: 20 mins. Portion each tenderloin into 4 even portions. One portion at a time, place between parchment paper or in a clear plastic bag and pound till thin using a mallet or heavy pan. Season with S&P and set aside. Heat barbeque to medium-low. In a large bowl combine vegetables, oil, oregano and S&P. When barbeque is hot, place fennel on grill and let cook for approx. 7 minutes before flipping. Be sure not to burn. Add peppers and zucchini to the grill and let cook till tender turning over once at the midpoint. While your vegetables are grilling heat a large skillet over medium-high heat. Measure your oil into a small bowl and set beside your stove. When pan is hot add a small amount of oil from the bowl to your pan and smashed garlic cloves. Add first round of pork and sear for approx. 2 minutes on first side and one on the second side. Don’t worry if the pork is still slightly pink it will finish cooking in the oven. Remove from the skillet and set aside into oven safe pan. Continue doing this until all your pork is done. Try not to use more oil than is in your bowl. Be sure to not remove garlic during this process, it will flavour your oil. If your pan starts to smoke reduce heat slightly. Once all the pork is cooked and set aside add your mushrooms to the hot pan. Saute until tender and slightly browned then deglaze the pan with wine. Add the stock and mustard and reduce heat to medium. Let simmer. Set your oven to 200º and place your pork into the oven. When your sauce has reduced to 1/4 of its original volume, season with S&P to taste and add chopped parsley. To serve place vegetable on your plate. Fan 2 portions of pork next to your vegetables and top with mushroom sauce. 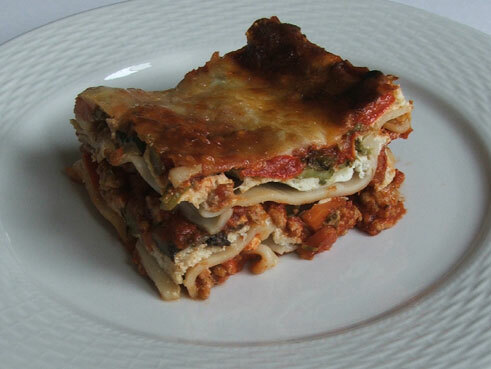 Lasagna is a favorite for many but when made traditionally it contains a tremendous amount of fat. Having lasagna every once in a while is fine but to enjoy it more frequently try alternating fatty ingredients with healthier options. I chose to add roasted vegetables to my version to add extra flavor and nutrients, you may choose a different selection like eggplant, fennel etc. This is also a great way to use up the veggies in your fridge. As I have mentioned in the past; I have replaced all pasta in my house with a brown rice version but this was my first time working with BR lasagna. I was pleasantly surprised as even my old italian boss wouldn’t have known the difference. Prep time: 50 mins. | Cook time: 1 hr. Set oven to 350º. Chop all vegetables and toss with oil and S&P in a large bowl. Spread onto a large baking pan covered with parchment and place in oven. Set timer for 50 mins. Place a large skillet over medium heat. Add oil, ground chicken, onions, garlic and S&P. Let saute till cooked throughly (approx. 10 mins) stirring occasionally. When finished mix with tomato sauce and cinnamon in a medium bowl. Set aside. In a medium bowl mix together ricotta, basil, egg and 1/2 c. of mozzarella. Season with S&P. Set aside. When vegetables are roasted remove from oven and leave temperature set to 350º. Spray or brush a 9 x 13″ baking dish with olive oil. Start by spreading 1/3 of meat mixture in the bottom of the pan. Follow it with a layer on lasagna noodles (do not overlap). Next spread 1/2 of ricotta mixture over noodles and top with 1/2 of vegetables. Repeat layering again starting and ending with meat mixture. Top with remaining 1 1/2 c. mozzarella then sprinkle with grated parmesan. Rip off a piece of tin foil slightly longer than the pan and fold in half lengthwise and then slightly flatten once again. Position over the pan creating somewhat of a tent so the foil is not touching the cheese. Crimp at the sides to tighten. Place in oven and cook for 45 mins. Remove foil and cook for another 15 mins. to brown cheese. Today’s Lesson: Smoking chicken in your own backyard. Smoking any type of meat, poultry or fish is a low-fat way to infuse flavor. Most people pass on doing this themselves assuming that it is too much work or it cannot be done without an expensive bbq smoker. When working with Chef Steffan Howard years ago I learned an easy makeshift way of smoking food with items most of us have at home. I have modified his original method slightly to include my bbq. This method will work for all types of protein listed above. 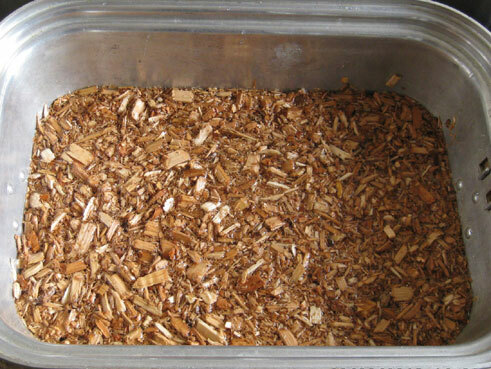 Fill bottom of pan with wood chips, you will probably only need 1/2 to 3/4 of the bag. Cover with tap water and let soak for 30 mins. When time has passed drain chips, mix with hand and place rack on pan. Stuff chicken with orange wedges and season with oil, rosemary and S&P. Place chicken on the rack and cover with the lid. Remove the racks from your bbq and set to high heat. Place pan directly on grill bricks. Reduce bbq heat to medium-high and let cook for approx. 1 hour checking on its progress 2 or 3 times. There should be constant smoke in the pan. Use a meat thermometer to determine when finished, chicken will be done when the breast reaches a temperature of 170°F (77°C). 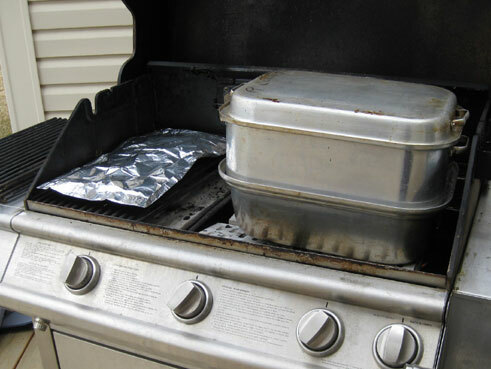 Safely remove from grill with mitts and serve immediately or keep covered in the refrigerator. 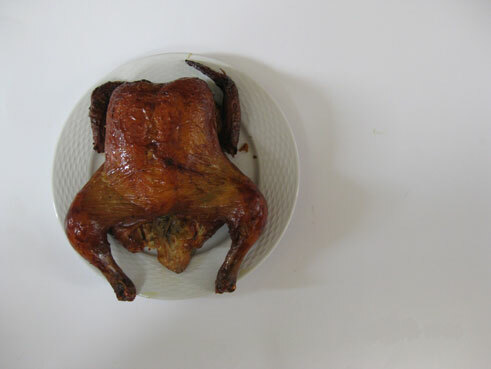 Smoked chicken can be eaten as is or in various dishes including pastas, salads, sandwiches etc. Stay tuned for a few of my favorites in the next week. Inspired by health. Motivated by temptation. Lean&Luxe is about staying in shape and eating healthy meals without sacrificing flavor. Join me on my journey of culinary indulgence. I promise not to disappoint. Enter your email address to subscribe to Lean&Luxe and receive notifications of new posts by email.